Stalin had been a dictator and a tyrant. Yet he presented himself as the Father of Peoples, a wise leader, and the continuer of Lenin's cause. After his death, people began to acknowledge that he was responsible for the deaths of millions of their own countrymen. Nikita Khrushchev, first secretary of the Communist Party (1953-1964) and premier of the Soviet Union (1958-1964), spearheaded this movement against the false memory of Stalin. 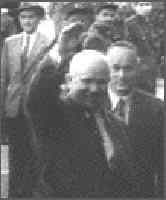 Khrushchev's policies became known as "de-Stalinization." On February 24-25, 1956, three years after Stalin's death, Khrushchev gave a speech at the Twentieth Party Congress that crushed the aura of greatness that had surrounded Stalin. In this "Secret Speech," Khrushchev revealed many of the horrible atrocities committed by Stalin. My heart is always full of Lenin. Comrades, I could survive the most difficult moments only because I carried Lenin in my heart, and always consulted him on what to do. Yesterday I consulted him. 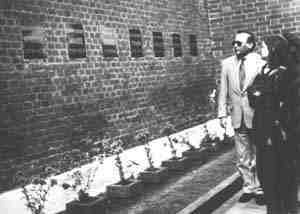 He was standing there before me as if he were alive, and he said: "It is unpleasant to be next to Stalin, who did so much harm to the party." This speech had been pre-planned yet it was still very effective. Khrushchev followed by reading a decree ordering the removal of Stalin's remains. The further retention in the mausoleum of the sarcophagus with the bier of J. V. Stalin shall be recognized as inappropriate since the serious violations by Stalin of Lenin's precepts, abuse of power, mass repressions against honorable Soviet people, and other activities in the period of the personality cult make it impossible to leave the bier with his body in the mausoleum of V. I. Lenin. A few days later, Stalin's body was quietly removed from the mausoleum. There were no ceremonies and no fanfare. About 300 feet from the mausoleum, Stalin's body was buried near other minor leaders of the Revolution. 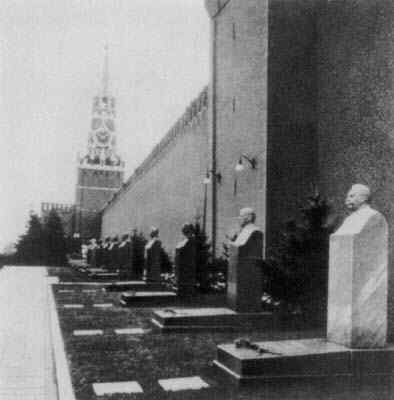 Stalin's body was placed near the Kremlin wall, half-hidden by trees. A few weeks later, a simple dark granite stone marked the grave with the very simple, "J. V. STALIN 1879-1953." In 1970, a small bust was added to the grave.